For almost two decades, Laura Kraut has represented the United States in the Olympic Games, World Cup Finals, and Nation’s Cup teams. 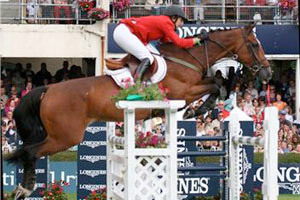 After a successful 2009 winter in Wellington, Florida, Laura and the horses returned to Europe for the summer. 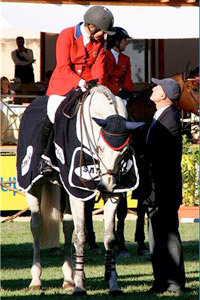 Kraut and Anthem has a successful start by winning the 2009 Grand Prix of Madrid, repeating their 2007 victory. 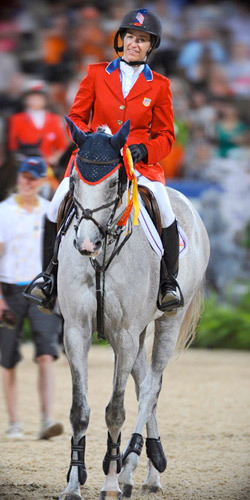 Cedric will be Laura’s Nations Cup horse for competitions in La Baule, Rome, St. Gallen, Rotterdam and Aachen. 2008 was a remarkable year for Laura and her team. Kraut and Cedric competed in the US Olympic trials held in Wellington, Florida. As Cedric was only ten years old at the time, Laura entered him in the trials for the experience, but they went on to win and earn a place on the 2008 Beijing Olympic Team. In August the pair traveled to Hong Kong and where Cedric continued to amaze everyone by winning the Team Gold Medal. While Laura’s focus was having Cedric ready for the Olympic Games, she was also busy on her other horses. 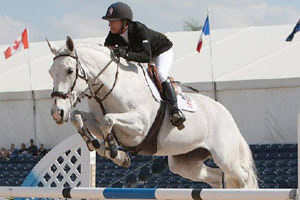 During the spring of 2008 Laura and her long-time partner Anthem traveled to North Carolina where they won the $500,000 Grand Prix of Charlotte. After successfully representing the US on several Nations Cup teams during the summer, Laura and Miss Independent went on to end an amazing year with Grand Prix wins in Brussels, Geneva, and London’s Olympia. Kraut has long been known for her positive outlook and sportsmanship. This attitude was recognized outside the equestrian world in 2003 when Laura was the recipient of the United States Olympic Committee’s Jack Kelly Fair Play Award. Established in 1985 to honor the late USOC President John B. (Jack) Kelly Jr., the award is presented to an athlete, coach or official for an outstanding act of fair play or sportsmanship during the past year. While a member of the USET team in the Dominican Republic, Laura’s horse suffered a slight injury that would not have caused it to fail a veterinary inspection, but might have effected the outcome of the competition for the team. 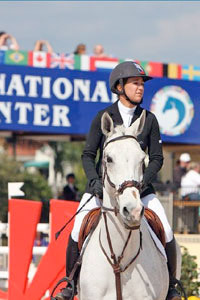 In order for the U.S. to qualify for the 2004 Olympic Games they needed to do well in the Dominican Republic, so Laura withdrew and the alternate competed. Laura wanted to support her teammates- so instead of catching the next flight home, she became the team assistant and cheered them on as they went on to win the gold medal and qualify for the Olympics in Athens. Laura Kraut shares one of her favorite exercises, the basic serpentine over fences. The proper execution of this exercise develops the horse’s rideability and the rider’s control, the core elements needed for success on course.